FAX C++/ActiveX is designed to C#, C++, VB.NET, and Delphi developers to combine Fax and Data. It is fully object-oriented, and takes into account the new emerging technologies. Developers can build black and white or color faxing applications within a few days using the Fax C++/ActiveX Development Toolkit, and can support a range of fax hardware platforms with a single application. Combined with other Black Ice products, such as the TIFF Printer Drivers, Voice C++/ActiveX, and Imaging libraries. Fax C++/ActiveX allows developers to rapidly build Fax Servers, Fax Back applications, applications with faxing capability, or to "Fax-Enable" existing applications. Fax C++/ActiveX also quickly and easily integrates with Visual Basic 2005, Visual Studio .NET, and Borland’s Delphi. Fax C++/ActiveX implements V.34 faxing based on the Class 1.0 fax command set, and will send V.34 faxes from any fax modem or board on the market that supports Class 1.0 and V.34 faxing. A fax sent at 33.6 kbps is more than twice as fast as a fax sent at 14.4 kbps. The increased transmission speed increases performance by drastically reducing training time. The support of the Mainpine RockForce multiport modems and the Multi-Tech V.34 fax modems are new additions to the list of hardware supported by Fax C++/ActiveX, which also supports V.34 faxing with the Brooktrout TR1034 boards and the Dialogic/Gammalink Cpi200B and Cpi400B boards. Fax C++/ActiveX supports both standard monochrome (black and white) faxing as well as color faxing. With more and more color-capable fax machines on the market, color faxing is growing in popularity, especially when combined with V.34 faxing speeds. Fax C++/ActiveX can determine if the receiving fax hardware is capable of receiving color faxes and will either send a color fax, or automatically convert the fax into a black and white representation. Fax C++/ActiveX queue management routines are highly optimized and thread-safe. They were designed to manage and distribute large numbers of faxes in a high-density environment for 96 or more channels per workstation. Existing applications can take advantage of the new queue management by upgrading to Fax C++ version 9.0 or higher. There is no need to modify the code of the application, just to rebuild the application with the new inclusion and library files, and update the Fax C++ DLLs shipped with the application. 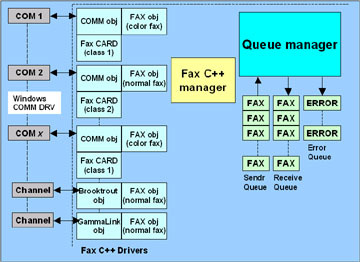 Also, Fax C++/ActiveX includes a Fax OCX that exports queue management methods allowing Visual Basic, Delphi, MS Access, MS FoxPro and .NET developers to handle fax queue management tasks with a few methods, thus avoiding time-consuming queue implementation. Fax applications based on Fax C++/ActiveX can access the image data of received faxes in real-time. This feature is only available for modems and Brooktrout boards. If real-time access to the received faxes is enabled, Fax C++/ActiveX will send a message to the application every time a buffer containing a portion of the image data has been received from the modem or board. The application can retrieve the image information and can use it to display the faxes being received in real-time or to run an OCR software application on the image. 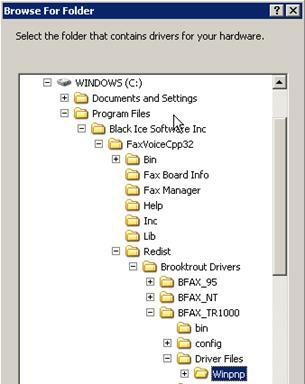 An e-mail to Fax and Fax to e-mail library is also available as an add-on to Black Ice Fax C++/ActiveX. The e-mail to fax library will convert the e-mail to TIFF format, and the TIFF that is generated is ready to be faxed with Fax C++/ActiveX. Need to convert documents into faxable images? You need a Black Ice Printer Driver which can convert any printable file into an image files such as TIFF. All Prices listed are effective as of 1/08/2009. The developed application which incorporates the Fax and/or Voice C++/ActiveX can be distributed to as many of your customers as wish. However, a runtime license must be purchased for each port/line that the distributed application will use. For example, if you distribute 100 copies of an application which supports 4 lines, then you must purchase 400 runtime licenses. Any class 1 modems such as Hayes, USRobotics, Multitech, Boca Research, Zoom, ZyXel, Apache, Motorola, and more. Any class 2.0 modems such as Hayes, USRobotics, Multitech, Boca Research, Zoom, ZyXel, Apache, Motorola, and more. Dialogic/Brooktrout SDK 6.5 support added to Fax C++ Version 12.65. Brooktrout SDK 5.0 support added to Fax/Voice C++ Version 12.30, includes support for Brooktrout's SDK 5.0. Brooktrout Fax Products to be Discontinued - TR114 / TruFax boards to be discontinued. Installation instructions for installing TR1034 hardware for use with Windows 2003 & Black Ice FAX C++/ActiveX. Brooktrout 4.9 driver support added to the Fax/Voice C++/ActiveX! Released in version 10.10, includes support for TR1034 Analog boards, graphical installation utility, Plug'n'Play drivers and more. Why doesn't the application see the Brooktrout board? There is a little known trick used by the Brooktrout test software. The test software is called “NTDIAG.EXE" and it is given out with the boards. The trick is that “NTDIAG.EXE" installs Brooktrout drivers and overwrites your board driver installation, giving you the illusion that your board installation is correct. The “NTDIAG.EXE" demonstrates that the Brooktrout board is functioning, but it does not install the Brooktrout drivers so that the board can be used with third party applications. Since the “NTDIAG.EXE" uses an unpublished technique to install the board’s drivers, you still have to go through the driver installation for third party products. For example, when you find that “NTDIAG.EXE" works, you still have to install the board drivers and reboot in order to work with the Impact Fax Server. The Brooktrout drivers are not installed. Another fax product is installed. “NTDIAG.EXE" is installed and the board works magically with “NTDIAG.EXE". You are able to send and receive faxes with “NTDIAG.EXE". Little known to anybody, is that “NTDIAG.EXE" sneakily installed it’s own drivers for the board. The Brooktrout drivers are installed again, as required by the read me file of “NTDIAG.EXE". The reality is that “NTDIAG.EXE" does not use the convoluted installation methods required of users during a Brooktrout board installation. For example, setting up the BT_CALL.CFG file, PEX firmware files and DIGITAL.CFG file, just to name a few. The “NTDIAG.EXE" only proves that the board works and nothing more! It has nothing to do with YOUR installation of the Brooktrout drivers. For details see the Brooktrout site at: http://www.brooktrout.com/support/index.html. Try to follow the instructions in the fax application's manual for Brooktrout board installations. If you are still having trouble, please contact Brooktrout or your board vendor for assistance. 10-06-2000. The Primary Rate ISDN - PRI PCI32V with E1 Network Interface is supported by the Fax C++. Install the latest version of Fax/Voice C++. Install your Brooktrout TR1034 board. Go to your MY COMPUTER icon (either on your desktop or in your START menu) and right-click on it. Select MANAGE. This will open the COMPUTER MANAGEMENT window. Click on DEVICE MANAGER. If there is an icon with a yellow question mark listed named “Computer Telephony Device”, right-click on it and select "Update Driver". If there is an icon labeled "Brooktrout Hardware", double-click on it to expand the menu. Right click on the TRxStream Board device if listed and select "Update Driver". 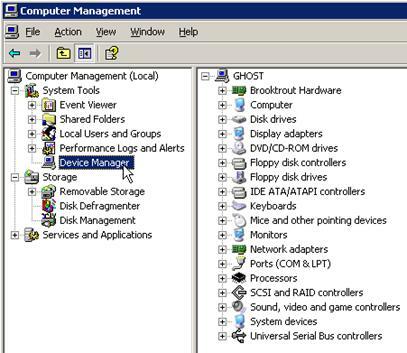 If none of the icons listed above are in the DEVICE MANAGER, click on the "Scan for hardware changes" icon in the toolbar (Computer with a Magnifying Glass). When the “Found New Hardware Wizard” appears click “No, not this time” and click NEXT. On the next screen, click “Install from a list or specific location (Advanced)” and click NEXT. Check only the “Include this location in the search:” check box and click the BROWSE button. Navigate to “C:\Program Files\Black Ice Software Inc\FaxVoiceCpp32\Redist\Brooktrout Drivers\BFAX_TR1000\Driver Files\Winpnp\”. Click OK to close the Browse dialog and click NEXT on the Hardware Update Dialog. If a “Security Alert- Driver Installation” dialog appears, click YES. When the “Brooktrout Hardware” dialog appears click NO. Click NEXT and then FINISH to complete the installation. You must now RESTART YOUR COMPUTER. Go to START menu and Run. Run C:\Program Files\Black Ice Software Inc\FaxVoiceCpp32\Redist\Brooktrout Drivers\BFAX_TR1000\bin\configtool.exe to run the Brooktrout Configuration Utility. When the Brooktrout Configuration Utility starts it will give you a “Configure IP Stack” dialog. Select None and then OK to continue. The default configuration should be sufficient but you may change some of the board settings from this window. Once you have finished, Click the SAVE button at the top, followed by Clicking the APPLY button next to it. The set-up process may take a few moments, but once it is complete, you may close the Brooktrout Configuration Utility. Your card is now set-up to work with our Fax/Voice C++ software. The current supported Dialogic driver is System Release 5.1.1. Version 9.0 of the Voice C++ / ActiveX SDK now supports Dialogic’s MSI product line. With MSI support, Voice C++ now lets C, C++, Visual Basic, Delphi and other software developers access features that were not available before. Voice C++ with Dialogic boards now can detect single, dual frequency tones and single, dual frequency tone cadences. The application can specify all the parameters of the tone or the tone cadence and every time the Dialogic board detects the specified tone, Voice C++ will send a message to the application that will identify the detected tone. This feature can be very useful when the central office or the PBX generates non-standard tones or in some environments where the application must detect non-standard tones or tone patterns. Voice C++ now supports answering machine detection with Dialogic voice boards. With the new feature applications can now dial a number, wait for an answer and detect if the answer comes from an answering machine or from a real person. As of October 23 2000, SCbus support is now available in the Voice C++ /OCX for high-density Dialogic boards. The Fax C++ implementation will be available by November 6th. The SCbus allows developers to build high-density systems to efficiently share resources so that multiple technologies can be connected to each port as needed. Black Ice Software is committed to CT Media and will begin rolling out products for CT Media. CT Media will be implemented first with the Impact product line, starting with Impact Fax Server and award winning Impact Voice Mail Server Deluxe. The Impact Fax Server is now available for CT Media, contact us to request a demo. DNIS for Dialogic. The GlobalCall software provides a uniform application programming Interface (API) for multiple network interface technologies. The GlobalCall API is designed to support a variety of protocols for E-1 CAS, T-1 robbed bit, ISDN PRI, and other interfaces. It provides a consistent application interface for the various protocols and technologies, and uses the same input and output parameters at the application level to configure and control the different interfaces. Black Ice Software continues to support the analog loop start interface through the standard voice library.